This book offers penetrating insight into the nature and process of perception through a skillful interweaving of the concepts of the new physics, evolutionary biology, and cognitive psychology with the profound insights of meditative traditions. We are shown how we may go beyond the harsh and narrow limits of beliefs and habitual patterns of thought and behavior to awaken fresh perception that is fearless and compassionate, experiencing the sacredness of the ordinary world. "I would like to invite the reader to take a journey on which we might, together, discover some of our own preconceptions and deeply hidden assumptions about our world. Thus we might occasionally glimpse, beyond them, immeasurable and inconceivable nature, which is at the same time not separate from the world we live in. Scientific insight into our deep-rooted presuppositions can be of help to us in our spiritual journey through this world, and at the same time, the practice of meditation can be grounded in a thorough scientific understanding of the human body and mind." "Hayward's book is a course in compassion and clear thinking as well as a panorama of physics, brain science, and consciousness." 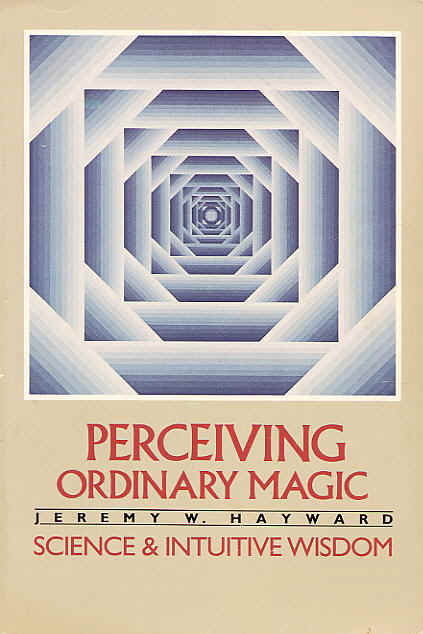 "What is especially compelling about Perceiving Ordinary Magic is less Hayward's visionary conclusions than the imaginative and intriguing process of spiritual and intellectual exploration by which he reaches them." Jeremy W. Hayward holds a Ph.D. in nuclear physics from Cambridge University and has pursued research in molecular biology at the Massachusetts Institute of Technology and Tufts Medical School. A senior student of Chogyam Trungpa, he has lectured extensively on Buddhism and its connection with Western traditions and science throughout North America and Europe. He is the vice-president of Naropa Institute and Shambhala Training in Boulder, Colorado.